After spending more than a year orbiting our planet on a hush-hush mystery mission, the U.S. Air Force's X-37B space plane is due to return to Earth any day now. Air Force officials haven't announced exactly when the robotic X-37B space plane will land. But on May 30, they said that the spacecraft's homecoming should occur in the "early- to mid-June timeframe" — a window that will close in the next week or so. The Air Force launched the X-37B on March 5, 2011, sending the reusable space plane design on its second-ever space mission. The X-37B currently zipping around Earth is known as Orbital Test Vehicle-2, or OTV-2. 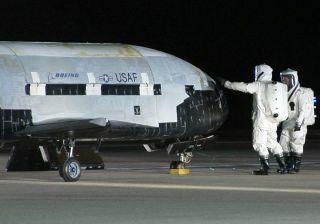 The X-37B looks much like NASA's now-retired space shuttles, only much smaller. The space plane is about 29 feet long by 15 feet wide (8.8 by 4.5 meters), with a payload bay the size of a pickup truck bed. A solar array packed in the payload bay powers the spacecraft. For comparison, two entire X-37Bs could fit inside the payload bay of a space shuttle. OTV-2's flight represents a big jump for the X-37B space plane. The vehicle has been aloft for 462 days as of today (June 8), more than doubling the on-orbit time of the first space-flown X-37B, known as OTV-1. OTV-1 launched in April 2010 and landed that December, staying on orbit for 225 days — well under the spacecraft's supposed 270-day limit. OTV-2 is nearly 200 days over that limit on its current flight, and the calendar keeps ticking over. Just what OTV-2 has been doing for so long up there remains a mystery, because the space plane's mission and payloads are classified. Air Force officials have said that the vehicle's chief task is testing out new technologies for future satellites, and some experts think that's likely to be the case. For example, the space plane may be observing the Middle East and Afghanistan with some brand-new spy gear, according to Brian Weeden, a technical adviser with the Secure World Foundation and a former orbital analyst with the Air Force. OTV-2's orbit — which takes it repeatedly over the stretch of Earth from 43 degrees north latitude to 43 degrees south latitude — supports this interpretation, Weeden told SPACE.com earlier this year. The space plane's orbital parameters are classified, but amateur astronomers have been tracking OTV-2's movements since it blasted off. The Air Force also probably wants to push the X-37B's limits on this second flight, to see just what the space plane can do, said Weeden, who published a report in 2010 that investigated the X-37B and its likely missions.